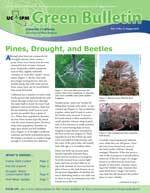 The University of California Statewide IPM Program presents the UC IPM Green Bulletin. This newsletter focuses on specific practices and information that pest management professionals can incorporate into their daily work to manage pests effectively while reducing pesticide runoff and other environmental problems. Agricultural crops are vulnerable to a variety of invasive pests and plant pathogens. The UC Cooperative Extension devotes research, projects and cooperative efforts with other agencies to mitigate and eliminate threats to county agriculture.